The delivery is too late please try to send the book fast. 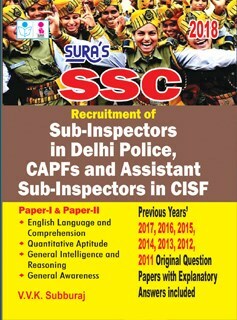 This book has all SSC - CPO sub-inspectors exam question and answers of 2011, 12 and 13. Very quick delivery and user-friendly website. I`m loving your website. SSC Recruitment Of Sub Inspectors is well framed. It is split into two parts- 1 and 2 both of which contains objective type Q&A. It`s very easy to follow and understand. Thanks to the author. Why is the English comprehension section repeated twice? I find it both in the first part and second part. This is the most recent books published for SSC Recruitment Of Sub Inspectors exam. Thanks for making it available on your website. It`s very helpful for me.